Which Californians will Lack Health Insurance under the Affordable Care Act? While the Affordable Care Act (ACA) is expected to reduce California’s uninsurance rate by at least half, we project that between 2.7 and 3.4 million Californians will remain uninsured by 2019. Projections from the California Simulation of Insurance Markets (CalSIM) model indicate that up to half of Californians remaining uninsured will be undocumented immigrants who are not eligible under the ACA. Most others lacking insurance will be eligible for Medi-Cal or subsidized insurance through Covered California but remain unenrolled due to difficulties with the enrollment process, inability to afford coverage, concerns about negative immigration-related consequences for themselves or their family members, or other barriers. Almost three-fourths of the remaining uninsured will be Latino, almost one-third will reside in Los Angeles County, and about 70% will be exempt from paying a tax penalty for lacking coverage. Millions of Californians have gained health coverage under the Affordable Care Act (ACA). In 2014, nearly 3 million Californians newly enrolled in Medi-Cal and more than 1 million enrolled in private coverage through Covered California.1 Additional Californians have gained job-based coverage or have purchased individual market coverage outside of Covered California.2 Survey data is not yet available to answer the question of how many Californians who enrolled in coverage were previously uninsured and how many remain uninsured. However, we can make projections about how coverage will change in the coming years. As ACA implementation continues, California’s uninsurance rate is likely to fall each year until enrollment rates level off by 2017 or 2018. We project that between 2.7 and 3.4 million Californians will remain uninsured by 2019, at which time the ACA will be fully implemented.3 The ACA is thus projected to reduce California’s uninsured population by at least half, as we estimate 6.5 million Californians would have remained uninsured by 2019 without the ACA. 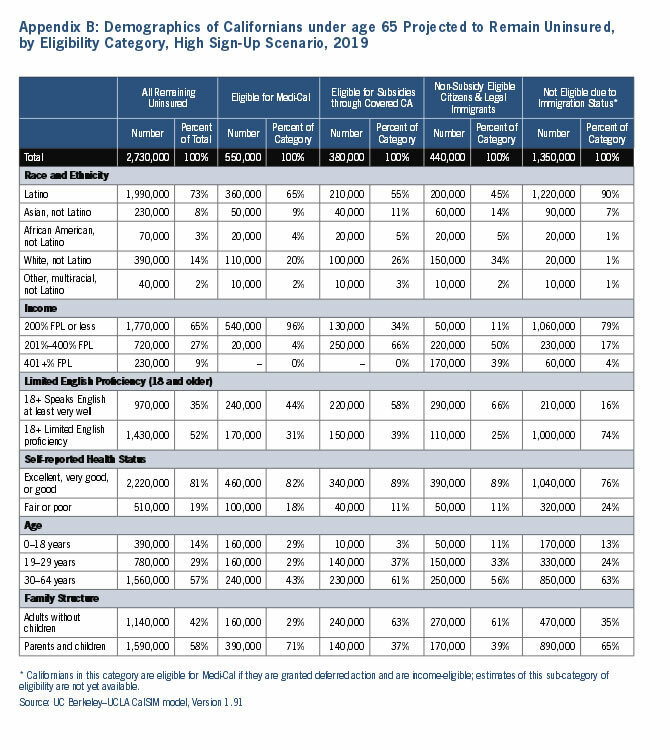 This report describes the projected eligibility for coverage of those remaining uninsured, as well as their demographics, geographic distribution, and likelihood of owing a tax penalty for lacking insurance. The report also discusses the reasons Californians may remain uninsured. We use projections from the UC Berkeley–UCLA California Simulation of Insurance Markets (CalSIM) model version 1.91, which simulates individual and firm decisions about health insurance. CalSIM models two scenarios, Moderate Sign-up and High Sign- Up, which differ in terms of the extent and effectiveness of outreach and enrollment efforts in the state. All estimates in this report reflect the number remaining uninsured at any given point in time in 2019. Undocumented immigrants are not eligible for federal coverage options under the ACA. While most of the estimated 2.5 million undocumented Californians are uninsured, many already have insurance through their own job or a family member’s job, through the private market, or through a coverage program for children available in certain counties, such as the county- and privately-funded Healthy Kids programs or Kaiser Permanente Child Health Plan.5 This trend is projected to remain largely unchanged under the ACA. 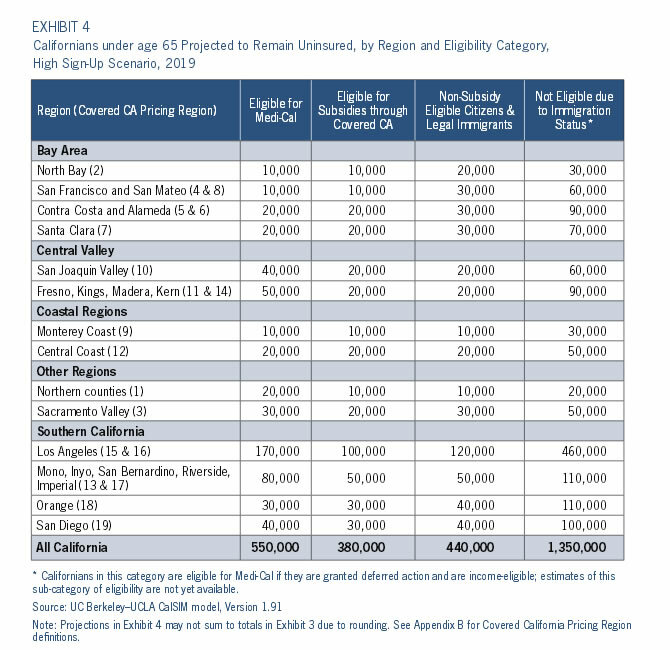 Overall, between 1.4 and 1.5 million undocumented immigrants in California are projected to remain uninsured in 2019, comprising up to half of all Californians remaining uninsured (Exhibit 1, page 3). It is important to note that the CalSIM model has not yet incorporated Medi-Cal eligibility and enrollment among immigrants with deferred action. Under California policy, undocumented immigrants granted relief from deportation, also called “deferred action,” are eligible for comprehensive Medi-Cal coverage. Approximately 125,000 young Californians with Deferred Action for Childhood Arrivals (DACA) were estimated to be Medi-Cal eligible as of February 2014,6 but it is not known how many have enrolled to-date. The number eligible for Medi-Cal under this state policy will grow in 2015 under President Obama’s recent Executive Action, which expanded eligibility criteria for the DACA program and created a new deferred action program: Deferred Action for Parents of Americans and Lawful Permanent Residents (DAPA). 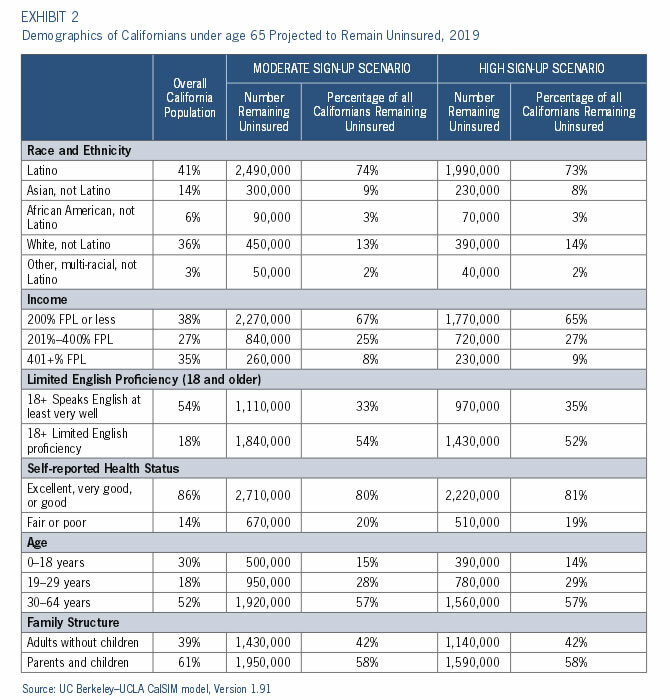 The projections in this report do not account for Medi-Cal eligibility among immigrants with deferred action because estimates are not yet available.7 While this state policy will reduce the number of Californians remaining uninsured, undocumented immigrants are likely to remain the largest group of California’s uninsured. This is because many undocumented immigrants will not be eligible for or apply for deferred action. Of those who receive deferred action, some will have income that is too high to qualify for Medi-Cal and others will be eligible for Medi-Cal but remain unenrolled. More than one-third of Californians predicted to remain uninsured (between 34% and 42%) are citizens and legal immigrants who are eligible for Medi-Cal or subsidized coverage through Covered California but are projected to remain unenrolled in 2019. 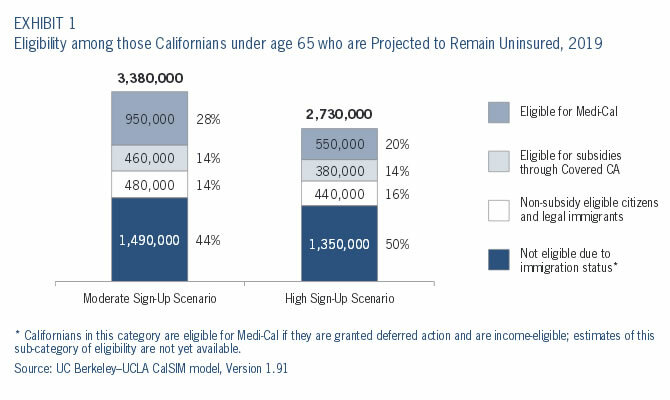 Between 550,000 and 950,000 Californians are projected to be eligible for Medi-Cal in 2019 but not enrolled, comprising between 20% and 28% of all remaining uninsured. Between 380,000 and 460,000, or 14% of all remaining uninsured, are projected to be eligible for premium tax credits and/or reduced copayments, co-insurance, and deductibles for private insurance purchased through Covered California (Exhibit 1). Between 440,000 and 480,000 citizens and legal immigrants, or 14% to 16% of all remaining uninsured, are projected to have the option to purchase insurance without subsidies through Covered California or the outside individual market in 2019. Of these Californians, approximately four out of ten are in households with incomes above the eligibility threshold for premium tax credits, which is $46,680 for a single individual and $95,400 for a family of four in 2014. Prior to the ACA, barriers to enrolling in Medi-Cal included lack of awareness of the program or eligibility standards, difficult application or renewal processes, burdensome documentation requirements, language and literacy obstacles, and immigrant families’ concerns about consequences of enrolling for themselves or family members when a family member is undocumented. The perceived cost of Medicaid has also been a barrier nationally, 9 which could affect California enrollment to the extent that eligible individuals are unaware that most Medi-Cal enrollees pay no premiums. Under the ACA, California is attempting to address some barriers to enrollment by simplifying enrollment and renewal processes, increasing the use of existing government data sources to determine eligibility, and creating a single streamlined application for Medi-Cal and Covered California enrollment, though these improvements are still in the process of being implemented. For those eligible for Covered California, barriers to enrollment include being unaware of their coverage options, challenges in the enrollment process, and inability to afford premiums or cost sharing. In spring 2014, the Kaiser Family Foundation (KFF) did a follow-up survey with Californians who had indicated in summer 2013 that they were uninsured. Among those who remained uninsured in 2014, KFF found that the most common barrier to health insurance enrollment was not being able to afford coverage (34%). Another 15% reported that the main reason they remained uninsured was that they didn’t qualify for coverage or financial help. The survey found that 9% did not know how to enroll and 9% had not tried to enroll or were too busy. Among Latinos who were eligible for coverage but remained uninsured, more than one-third (37%) reported being very or somewhat worried that enrolling in health insurance would draw attention to his/her own or a family member’s immigration status. 10 In the near future, this concern may decline among families with members who receive relief from deportation as a result of the recent Executive Action expanding deferred action programs. Latinos and individuals with limited English proficiency (LEP) are projected to comprise a disproportionate share of those remaining uninsured in California in 2019. Approximately three-quarters (between 73% and 74%) of those projected to remain uninsured are Latino, compared to 41% of the overall California population. More than half (between 52% and 54%) of adults projected to remain uninsured are LEP, compared to 18% of the overall California adult population (Exhibit 2). Californians projected to remain uninsured are also more likely to live in households with incomes of 200% of the Federal Poverty Level (FPL) or less, which is equivalent to $23,340 for a single individual and $47,700 for a family of four in 2014. Low-income households are projected to make up approximately two-thirds of the remaining uninsured in 2019 (Exhibit 2), compared to 38% of the California population. Californians with household income below 200% FPL are likely users of safety net health-care providers. Among low-income Californians projected to remain uninsured, up to 60% are undocumented, while 30% are eligible for Medi-Cal.11 See Appendix B for demographics of Californians remaining uninsured categorized by whether they are eligible for Medi-Cal, Covered California with subsidies, Covered California or the individual market without subsidies, or are ineligible due to immigration status. Nearly one-third (31%) of Californians projected to remain uninsured in 2019 are in Los Angeles County, which is higher than the County’s share of the state population (26%). Los Angeles County also has the state’s highest share of residents who are projected to remain uninsured (9.5% compared to 8.0% of the statewide population). Exhibit 3 shows the number of Californians projected to remain uninsured by region, in relation to the total population for each region and as a share of all uninsured in the state. Regions vary in terms of the eligibility for coverage among those remaining uninsured. Exhibit 4 shows how many of the remaining uninsured in each region are eligible for Medi-Cal or Covered California with or without subsidies, or are ineligible due to immigration status. These regional projections can be used to inform targeting of outreach and enrollment efforts and planning for local programs that provide care to the uninsured. While California has made much progress in expanding health coverage under the ACA, our projections highlight the need for continued efforts to increase coverage rates and provide access to care to those who lack coverage. Up to half of California’s remaining uninsured are undocumented immigrants who are ineligible for federal coverage options under the ACA. Some of these undocumented and uninsured Californians will continue to rely on existing programs, in ten counties, that provide care to low-income undocumented immigrants.13 Others will soon gain access to Medi-Cal under state policy if they receive deferred action as a result of President Obama’s Executive Action on immigration and if they are also low income. However, many would still lack access to coverage or care. Under proposed state legislation (Senate Bill 4—the Health for All Act of 2015), all undocumented immigrants in California would gain access to equivalent coverage options available to other Californians. This would include eligibility for comprehensive Medi-Cal and for private insurance purchased through a parallel Marketplace with state-funded subsidies to make coverage more affordable, depending on income. More than one-third of Californians projected to remain uninsured will be eligible for Medi-Cal or coverage through Covered California with subsidies. 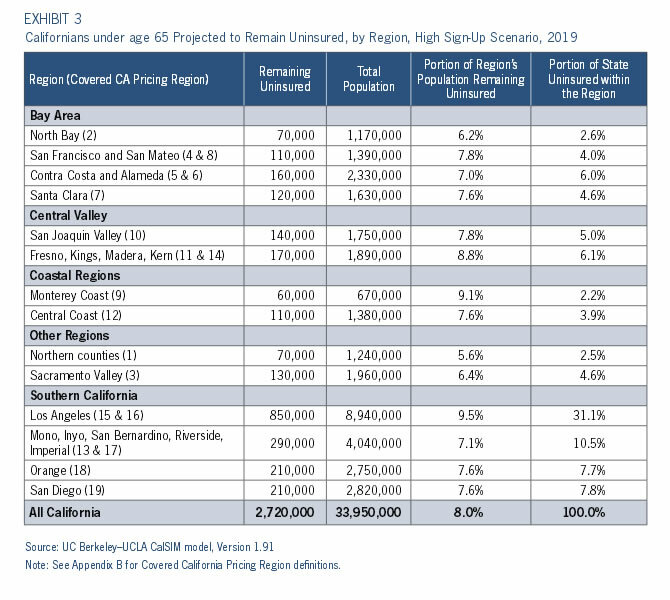 Though it is unlikely that all eligible Californians will enroll, enrollment could exceed these projections if outreach efforts are maximized and enrollment processes are optimally streamlined. Covered California will need to continue to refine its outreach efforts targeted at difficult-to-enroll populations, and to work with community organizations and consumer advocates to identify and implement innovative approaches to enrollment. Because two-thirds of Californians projected to remain uninsured are low income, adequate funding for the safety net providers who serve a large segment of the uninsured, including public hospitals and public and non-profit clinics, continues to remain an important priority. 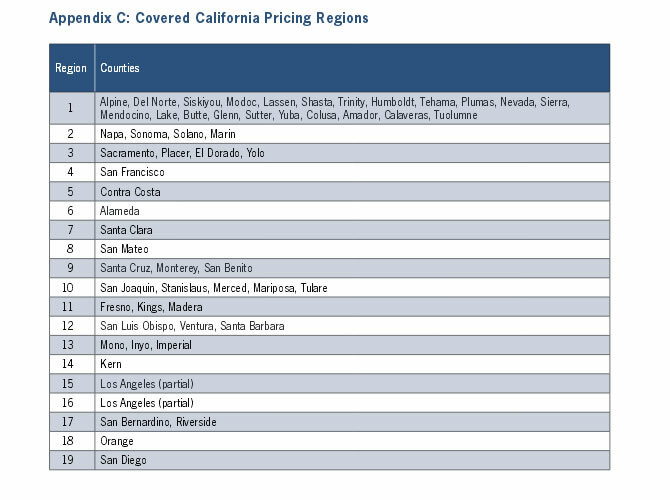 This report uses the California Simulation of Insurance Markets (CalSIM) model, version 1.91. The model is designed to estimate the impacts of various elements of the ACA on employer decisions to offer insurance coverage and individual decisions to obtain coverage in California. CalSIM uses data from the national Medical Expenditure Panel Survey (MEPS) Household Component, the California Health Interview Survey (CHIS), firm-level wage distributions from the California Employment Development Department, and the California Employer Health Benefits Survey to build a California-specific model. For further information, please visit http://healthpolicy.ucla.edu/publications/Documents/PDF/2015/calsim1.91methods.pdf. Toby Douglas, Department of Health Care Services, Affordable Care Act Year Two: Implementation Updates Renewals, Outreach and Enrollment, October 2014. Covered California, Individual Market Enrollment Report—October 16, 2014. Kaiser Family Foundation, Where are California’s Uninsured Now? Wave 2 of the Kaiser Family Foundation California Longitudinal Panel Survey, July 30, 2014. This report focuses on the year 2019 because certain provisions of the ACA are phased in over time, such as the employer and individual responsibility provisions which are fully implemented in 2016, and the excise tax on high-cost health plans which is implemented in 2018. We also focus on 2019 because we project that enrollment will level out in 2017 or 2018 based on trends from past health-care expansions, like Massachusetts state health reform. Lucia L, Jacobs K, Dietz M, Graham-Squire D, Pourat N, and Roby D (UC Berkeley Center for Labor Research and Education and UCLA Center for Health Policy Research), After Millions of Californians Gain Health Coverage under the Affordable Care Act, Who will Remain Uninsured? September 2012. Pew Hispanic Center estimated that there were 2.5 million undocumented immigrants in California as of 2012. The UCLA Center for Health Policy Research estimated that 51% of undocumented Californians were uninsured in 2009, while 25% had private coverage. The remainder reported public coverage, much of which is likely to include Healthy Kids and restricted-scope Medi-Cal which covers limited services like emergency and pregnancy-related care. Passel, JS, Cohn D, and Gonzalez-Barrera A (Pew Hispanic Center), Population Decline of Unauthorized Immigrants Stalls, May Have Reversed, September 23, 2013. Wallace SP, Torres J, Sadegh-Nobari T, Pourat N, and Brown ER (UCLA Center for Health Policy Research), Undocumented and Uninsured: Barriers to Affordable Care for Immigrant Population, August 16, 2013. Brindis CD, Hadler MW, Jacobs K, Lucia L, Pourat N, Raymond-Flesch M, Siemons R, and Talamantes E (UC Berkeley Center for Labor Research and Education, UCLA Center for Health Policy Research, UCSF Philip R. Lee Institute for Health Policy Studies), Realizing the Dream for Californians Eligible for Deferred Action for Childhood Arrivals (DACA): Demographics and Health Coverage, February 2014. A forthcoming report will provide estimates of Medi-Cal eligibility among those who will receive deferred action. Upon release, the report will be available on the UC Berkeley Labor Center website and UCLA Center for Health Policy Research website. If the Children’s Health Insurance Program (CHIP) is not maintained or if funding is not authorized by Congress beyond September 30, 2019 (the date on which the CHIP Maintenance of Effort requirement expires), more children may become uninsured than estimated in these projections. Without the CHIP program, fewer children would be eligible for Medi-Cal in California and a higher number of children would be caught in the “family glitch” in which health coverage offered through a parent’s job is deemed affordable because of the cost of employee-only coverage, even when family coverage is unaffordable. Under federal ACA regulations, these families would not be eligible for subsidized coverage through Covered California. Kaiser Family Foundation, Key Lessons from Medicaid and CHIP for Outreach and Enrollment under the Affordable Care Act , June 2013. UC Berkeley–UCLA CalSIM model, Version 1.91, High Sign-Up Scenario. Congressional Budget Office, Payments of Penalties for Being Uninsured Under the Affordable Care Act: 2014 Update, June 5, 2014. Alameda, Fresno, Kern, Los Angeles, Riverside, San Francisco, San Mateo, Santa Clara, Santa Cruz, and Ventura counties offered non-emergency services to undocumented residents as of 2013. Health Access Foundation, California’s Uneven Safety Net: A Survey of County Health Care, November 2013. California Health Care Foundation, California Indigent Care Program Profiles, 2009.